'You are dismissed,' Judge Hog said distractedly, staring out over the cheerful vista of Neopia Central. 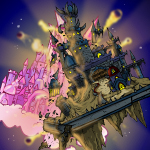 Ever since the new building had been created to house the Defenders of Neopia at the very core of Neopia's greatest city, it had always been a sight to ease the heart of the veteran hero, reminding him of those he fought to protect, yet even the magnificent view from his high office was not enough to settle him today. It had not even been a full hour since his return to Neopia Central, and yet already it felt a lifetime had passed. Heaving a deep sigh, he turned his back to the enchanting view and surveyed his office. His closest advisors still sat opposite his desk, both the gruff orange Yurble and distinguished pink Elephante mirroring his unease, looking over the collection of papers that had taken pride of place upon the polished wood. Seven different envelopes, each containing a different cryptic riddle. Each signed off with the same two letters. Suddenly he was aware of another, standing openly behind his companions. Green snot still clung to the unfortunate Zafara's blue fur despite her best efforts, but it seemed she had long since forgotten about it. By her sides both paws had balled into fists, quivering uncontrollably. Neither of the others seemed to have noticed her continued presence as the other members of the organisation had filed out. 'You are dismissed,' Judge Hog repeated firmly. 'I need to report, sir,' the Zafara replied, trembling under his stare. As one all three others in the room turned their heads to look at her, eyes wide with surprise. Somehow their shock seemed to instil a new confidence into her, calming her nerves. Judge Hog recovered first, turning his back on her once more to stare out of the window, yet she could almost feel his attention focused on her. 'Kribal,' Judge Hog finished for her, sighing deeply. She nodded agreement. 'That confirms it then. What did he say?' he added, looking over his shoulder at Jess. By the window Judge Hog allowed the flow of conversation to pass him by. Kribal, he thought to himself, staring out over the busy streets of Neopia Central again. Why would Kribal have been sent to deliver a letter to Meuka? Unless of course, he had expected the repulsive creature to be resistant. The latest hunt had been highly publicised in The Neopian Times, so it would not have required much effort to know how close they were getting. Had Kribal been supposed to be found? Were his words as the Yurble had suggested, a message sent to reinforce those haunting words. The game has begun. The Moehog nodded slowly at the window, still staring out with an almost longing look in his eyes. 'A fair point,' he replied. 'And I think you may be right. Jess, pull up another chair and take a seat.' He waved her toward another chair sitting against the wall. Quickly she pulled it over to where the others sat and eagerly seated herself, waiting for Judge Hog to sink into his own. Whatever she had found herself in, it was major. Jess felt her jaw drop foolishly. 'Who is he though?' she asked. Collapsing back still further, Jess allowed the weight of what was happening to sink in. The strange Kougra had roused suspicion of something deeper, but this? This was the sort of thing the wild conspiracy nuts normally went in for. To discover it was the truth pushed her belief to its limit. 'So, what do we do this time?' she asked at length, looking between the other three pets. Both Yurble and Elephante averted their eyes, uncomfortable grimaces spread across their faces. 'And what about me?' Jess piped up, the flow of conversation soaring above her head. Still grumbling, the Yurble nodded his reluctant agreement, joining the amicable Elephante as they filed from the room, the seven riddles clutched delicately in their hands. Jess stood and pulled off a perfect salute to Judge Hog, but he was already back to staring out over Neopia Central, that same wistful look in his eyes as before. There was more to all this than he was letting on, but for now she let it go; they had far more pressing issues to deal with, and she trusted he would not hold back anything that could jeopardise their mission. It was time to go hunting.